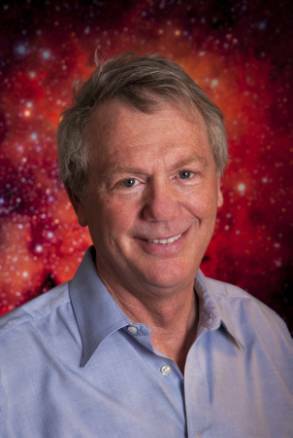 Cosmologist Robert Kirshner will discuss dark energy and the accelerating expansion of the universe in a free public lecture on Wednesday, May 13, at 7 p.m. at the Rio Theatre in Santa Cruz. Kirshner's talk, "The Accelerating Universe: Einstein's Blunder Undone," is presented by the UC Santa Cruz Department of Astronomy and Astrophysics and UC Observatories as part of the Mandel Lecture Series. Kirshner, the Clowes Professor of Science at Harvard University, is a frequent public lecturer on science. He teaches a general education course for Harvard undergraduates entitled "The Energetic Universe" and is the author of The Extravagant Universe: Exploding stars, dark energy, and the accelerating cosmos. The discovery of the acceleration of the expansion of the universe is one of the most surprising results of 20th century astrophysics. Around 1916, Albert Einstein famously introduced a "cosmological constant" to make his equations fit a static universe. In the 1930s, the work of Edwin Hubble and others showed that we live in an expanding universe, leading Einstein to call the cosmological constant his "greatest blunder." But in the 1990s, astronomers began to develop sharp tools for accurately measuring the history of comic expansion over the past 5 billion years. Observations of supernovae (exploding stars used to measure cosmological distances) showed that the universe is not just expanding, but that the expansion is speeding up. Cosmologists attribute this astonishing fact to the presence of "dark energy," which may be a modern form of the cosmological constant. Kirshner's work on the acceleration of the universe with the "High-Z Supernova Team" helped lead to the 2011 Nobel Prize in Physics, which was awarded jointly to his students Adam Riess and Brian Schmidt and to Saul Perlmutter of Lawrence Berkeley Lab. Kirshner and the High-Z Team shared in the Gruber Prize for Cosmology in 2007 and the Fundamental Physics Breakthrough Prize in 2014. A member of the American Academy of Arts and Sciences, he was elected to the National Academy of Sciences in 1998 and the American Philosophical Society in 2004.